After yesterday's sad news it is a little hard to think of what kind of story to run with. Luckily gingerbread has been taking away that empty feeling for years, and like all horrible break-ups excels in temporarily filling the void. Thankfully the talented hands at Canoe Brewpub not only create pub names that rock, but Star Wars based gingerbread vehicles, so this post doesn't go too off tangent. Part of a bakery contest at the Inn at Laurel Point, if you ask me, the detail has it light years ahead of the competition. And it has it's own Chewie! 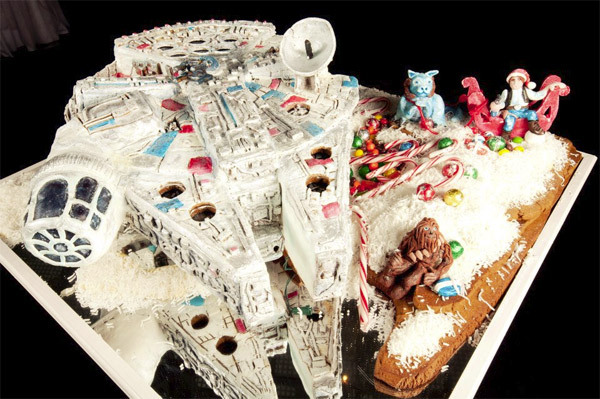 I mean what would a Star Wars gingerbread be with out the franchises most famous ginga? Am I right or what? Pre-answer reminder - one response will damage my ego, so please be gentle. I wont be posting for a few days [or maybe longer...] as last night my elderly mother passed away after a long ilness. I am really sorry to hear that Karl (hugs). While the duress of living with illness has found release, adjusting to the loss of those we laughed with, shared with and cried with most... well, it just bites. Take however long you need mr, you know where to find me/us when you are ready. For all of us STAR WARS fans. Dan, there was a tug boat named the Millennium Falcon operating right next to the ship i'm on today earlier this morning. too bad i didn't have my camera with me. Thanks for the comments guys and welcome to IADW Keith!